The Yin-Yang symbol is ubiquitous – from coffee mugs and tattoos, to t-shirts and key rings. Although its teardrop-shaped halves are generally interpreted as”good and evil”, “negative and positive”, “male and female”, or “dark and light”, among martial artists, its value runs deeper. While most commonly associated with Chinese systems, it also has a profound and abiding connection to Okinawan, Japanese and International Karate-Do. 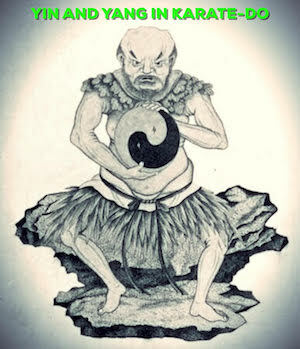 For example, Yin-Yang, translated as In-Yo in Japanese, becomes Go-Ju (Hard-Soft) in physical application. As long-time practitioners of external (linear and dynamic) styles mature, they frequently develop a more natural and reflexive approach to combat. Some martial artists describe this evolution as “soft blocks and hard strikes”, however at Northern Karate Schools, our philosophy and methodology is based on duality. Neither hard nor soft, we define itas “liquid steel”. Powerful yet malleable, it enables us to be aware of our surroundings and partners, while listening to our bodies and avoiding self-inflicted injuries. Yin and Yang is the essence of martial practice and life in general, and rather than viewing things as strictly “good” or “bad”, we recognize it’s often a matter of perspective. We’re born. We die. It’s the “in between” that defines us. When we apply Yin and Yang principles to Karate-Do, we are in harmony with the universe and following the middle path to a more fulfilling life.